Created to simplify the process of clinical rotations of allied health and nursing programs, Rotation Manager is necessary for any program, user-friendly compliance software that allows schools, students, and hospitals to save and quickly access any and all records for compliance with the hospitals rotation requirements. Below are some FAQS regarding Rotation Manager. 1. Is this American Data Bank? No, American Data Bank is a document repository, mainly focused on background checks and immunizations. There are more documents required by hospital sites for the rotations. Rotation Manager focuses on clinical rotations and is a unified file cabinet, accessible by the students, hospital and school. Rotation Manager includes a robust scheduler for clinical rotations, and all the compliance tools a school and hospital would need to make clinical education an easy and smooth process. Rotation Manager is a one-stop shop for your clinical education needs. 2. Do the students need to upload their documents or does the school do it? The system is flexible and adapts to your current process. If in your school, the students are the ones gathering their documents, they can upload these with Rotation Manager. If, however, it is you, the clinical rotation manager, who does it for them, you may upload documents on their behalf on Rotation Manager. 3. What about expiration dates? The system fully manages documents with expiration dates. You will no longer have to run after students for an expired CPR card. The system performs a check every night, and sends a reminder to the clinical rotation manager and to the students, when documents are expired or will expire within 30 days. Moreover, you will get a red flag if you are trying to assign to a rotation a student whose document is currently valid but which will expire before the end of the rotation. 4. I am a college administrator. Do my clinical partners need to use Rotation Manager? No. Rotation Manager works independently of who else uses it. Your college may start using Rotation Manager right away. 5. How do you know what each hospital site needs? Requirements from hospitals and clinical sites are usually already in our system. If they are not, we will be happy to quickly add them for you. 6. Do we need IT? No, because Rotation Manager is simply a web application. No installation is necessary. 7. What about the security of the documents? For what regards financial information, we are PCI compliant. Rotation Manager also incorporates HIPAA compliance features built-in and is FERPA compliant. 8. Are we going to have to scan everything? Think about your current process. Don’t you have to digitize the documents anyway? Rotation Manager offers a platform for you to share these with your clinical partners, within the context of rotations. Students do not need scanner, as they may take pictures of their documents and upload them directly from their smartphone to meet clinical site requirements. 9. What if the students upload junk? Rotation Manager features a two-step verification process. The computer will always need a human eye to review the documents (so the clinical rotation manager’s job does not go away). In this two-step process, the school assigns students to rotations, and then confirms them after verifying their documents. Students do not appear on the hospital user’s screen until they are confirmed by the school. Clinical coordinators may also elect to add an additional review on specific documents. They may also create accounts. Some hospital sites actually require documents from instructors. If that is the case, instructors will see these requirements online. 11. What about customer service? Rotation Manager is supported by a fully-staffed 3-tiered customer service help desk from 9AM to 5PM. Our solution is user-friendly, intuitive, and simple to use. It is supported by a fully staffed 3-tiered helpdesk. We also provide the training that ensures your staff can ramp up quickly and thus benefit right away from paperwork-related efficiencies. This training takes 1 hour and may be done entirely online. 13. How do you differ from other similar companies? 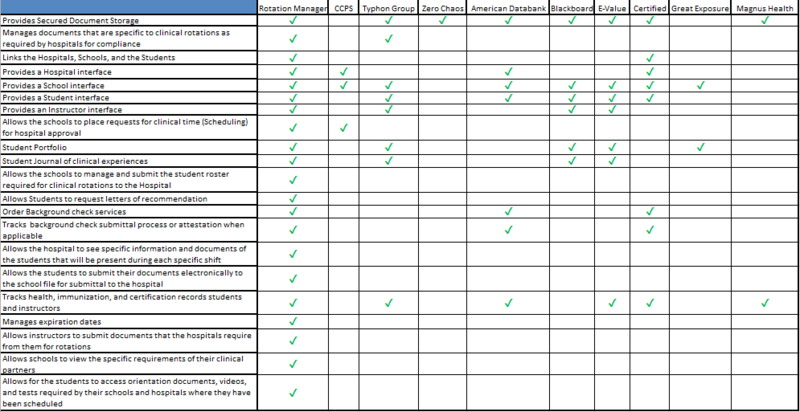 Click to enlarge the chart below to see how we compare to the competition. If you have a question that wasn’t covered on this page, please contact us today and we’ll be happy to help!